"The World's Greatest Private Investigator!" 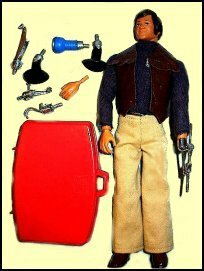 of the Bionic Man inspired Kenner to produce the J.J. Armes line in 1976.
and fold open front for hasty exits. These were the only two toys, not counting the figure, made for the series. for the MIU and C.A.M.P. playset.